"...Is a Fluidampr performance damper going to help release more power? 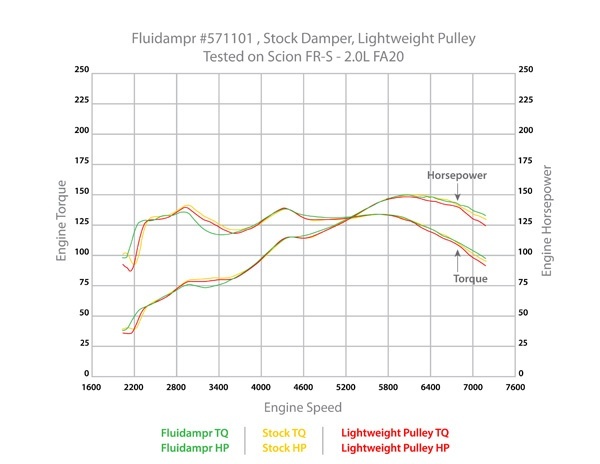 For that we turn to the chassis dynamometer data..."
From our previous posts we showed overall torsional vibration waterfall maps and highlighted specific order comparisons between the stock elastomer style damper, a lightweight crank pulley and the new Fluidampr viscous style damper on our near stock Scion FR-S test engine. 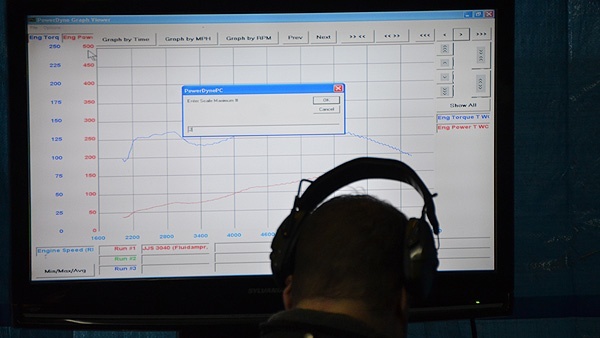 What do crankshaft torsional vibration frequencies and amplitudes mean on the street or racetrack? Beyond the torsional vibration protection, durability and efficiency benefits, is a Fluidampr performance damper going to help release more power? For that we turn to the chassis dynamometer data collected during our speed sweeps. 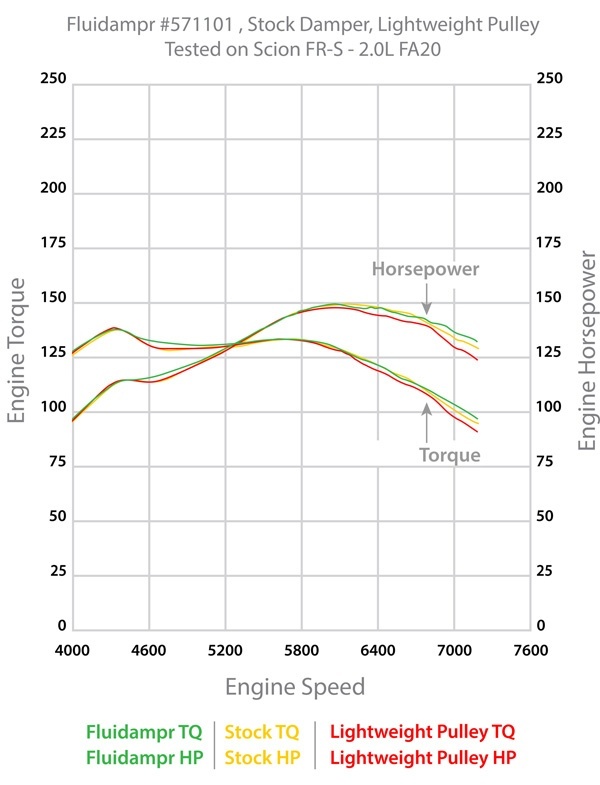 We expect that as more performance modifications are done to the engine to increase torque and horsepower that the differences between 4,000 – 7,000rpm will become more apparent. Success. Vibratech TVD improved torsional vibration control and efficiency of the Subaru FA20 / Toyota 4U-GSE engine with a viscous style Fluidampr® brand performance damper. It was an ever greater accomplishment to have proven a small sized viscous damper within the same size constraint as the OEM tuned elastomer damper and on a small displacement, short crankshaft opposed-four engine. The new Fluidampr (p/n 571101) is now available through quality parts distributors and retailers in the automotive aftermarket and performance racing industry. The complete eBook is available below. Tell us your thoughts about this project in the comments below. Look for next week’s blog post where we’ll discuss potential future implementations of small sized viscous crankshafts dampers. * Disclaimer - Vibratech® TVD and / or Fluidampr® products have no connection or affiliation in any way with Subaru, Scion or Toyota and / or their affiliates. References to any trademarked product(s), names(s) or OEM part is intended solely for reference to the usage for that Fluidampr part. Together We Protect The Engines That Move The World. Vibratech TVD is a global leader in viscous damper manufacturing, engineering, and torsional vibration analysis for gas engines, diesel engines and powertrain applications. ISO 9001:2008. Made in USA.